Some of the laundry piles that filled my bedroom this week. You think you have it all together. Then you end up in a check out line at Old Navy for the second time in the same half and hour with a poopy two-year-old and the lady in front of you sniffs around disgustedly. “What is that smell?” she whines. You take a deep breath then let her have it. Then you realize you are struggling. You wish you had it all together. The reality is there are dishes in your kitchen that have sat there for four days and you are going for the my-floor-is-so-nice-you-could-eat-off-it award. Not because it’s as spick and span as one of your dinner plates, but because it has so much food on it you could literally eat an entire meal from the trimmings. Then you find yourself knee deep in laundry. 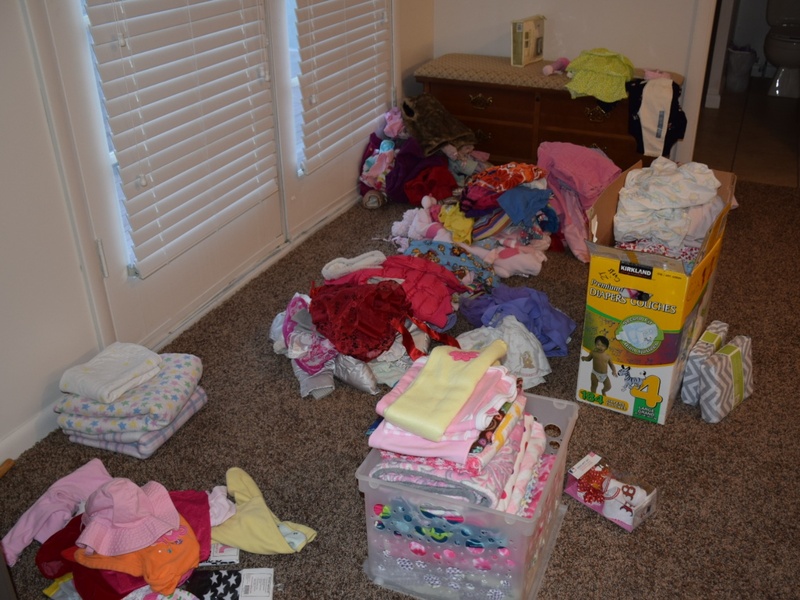 The four garbage bags full of much-needed little girl clothes that your sister gave you have been dumped and scattered all throughout your master suite. It looks like your washer and dryer exploded in there. Your baby won’t stop crying when you are heading home from a holiday party. You promised your kids you’d stop to get a treat but make them settle for a drive-thru Frosty from Wendy’s. The baby starts screaming so loudly that you unbuckle her while waiting for the food and start nursing her in the back seat of the van. Then your husband looks in the rear-view window and spots the car-seat-checking worker from the hospital where you delivered. Luckily she didn’t notice you because she probably would have called the police. A week has gone by since your newborn’s umbilical cord has fallen off yet you still haven’t had the chance to officially bathe her. You get texts and Facebook messages, look at them when you’re running errands, and then realize several days later that you never replied. You have a stack that is two-feet high of junk mail, school flyers and congratulations-on-the-new-baby cards that you still need to sort through and get out of the center of your living room. You wear the same sweats as pajamas that you wore all day because you are too worn out to change. The list of things you’re failing at could go on and on. My list is never ending. The truth is I’m a sleep-deprived postpartum hormonal mother who is too tired and overwhelmed to get everything done that I think would make me feel like I am a successful stay-at-home mom. The reality is I nearly lost it this week while shopping for outfits for my family to wear while we take family photos this weekend. Photos that will make us look like a normal family who has it all together. I’ll look like a happy, smiling mom who curls her hair and wears cute shoes. My boys will wear matching, non-holey clothes and fancy shoes – not crocs. We’ll huddle close and act like we never fight. I’ll post pictures on Facebook and people will think we have it all together. But we don’t. And I’m beginning to come to grips with the fact that we quite possibly never will. I think you are doing a mighty wonderful job! Nobody has it together all the time and if they do it’s probably because they have a nanny or lots of help! -I finally got around to folding 4 baskets of laundry at 2am, several days after laundry was done. -Ran out to take the garbage cans this morning when I got up to pump and hoping I didn’t miss the pickup.. Again. Why do they come so early?!?! I’m usually not up and going before 10am! I think it’s great to be honest about the chaos that is our lives. There’s nothing more frustrating than feeling like everything is falling apart around us and seeing so many sugar-coated blogs and articles that make us feel like terrible failures. I’m starting to gauge success in a very different way now that I’ve been a stay-at-home mom for two years. Sometimes, just surviving the day and showing a little extra patience with my kids (and myself) is a huge success. Amen! I think that a lot of people naturally want to put their best selves forward. But what we don’t realize is we can make each other feel inadequate if we always flaunt how amazing we are 🙂 We are all just doing the best we can.